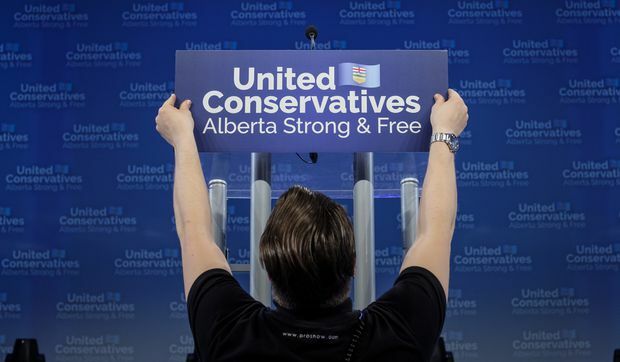 Technicians prepare the stage where United Conservative Party leader Jason Kenney with address supporters in Calgary, Alta., on Tuesday, April 16, 2019. British Columbians should brace for higher gas prices after the election of Jason Kenney and his United Conservative Party in Alberta – his promise to turn off the taps on fuel exports to B.C. will have swift consequences. But for the BC NDP government that he is targeting, there may also be the sliver of a silver lining amid what’s sure to be stormy relations with Alberta. Mr. Kenney has vowed that his very first act in office would be to enact a law that was drawn up by the outgoing NDP government of Rachel Notley. The law gives the Alberta government the power to restrict the supply of oil and gas to B.C., the “turn-off-the-taps” bill. It is expected to drive up prices at the pumps. But Alberta’s premier-designate is also opening a much wider front with the federal Liberal government on climate action. The UCP is committed to rolling back the Notley government’s carbon regulations – further damaging Prime Minister Justin Trudeau’s national plan to fight climate change. As Mr. Trudeau prepares for a fall federal election, Ms. Notley’s defeat means he has lost another ally on climate policy. Mr. Kenney’s election means B.C. Premier John Horgan is the only provincial leader west of Quebec to support a carbon tax. That makes Mr. Horgan the most important ally Mr. Trudeau has on environmental action. And Mr. Horgan has his own needs, from federal support to combat money laundering to cash for affordable housing and transit projects. But while a new-found warmth between Ottawa and British Columbia will have some benefits for Mr. Horgan, they won’t be enough to blunt the pain of what’s coming from next door. A trade war between British Columbia and Alberta was already triggered – though on the back burner – by B.C. 's threat to cap the amount of Alberta oil flowing through the Trans Mountain pipeline at the existing rate of 300,000 barrels a day. Citing the threat of an oil spill from increased oil tanker traffic, the B.C. government hopes to thwart the expansion of the pipeline that Alberta sees as the key to getting its landlocked oil products to new markets. B.C. has asked the B.C. Court of Appeal to approve of its proposed oil transport legislation, and a decision is pending. In response, Alberta temporarily banned the sale of B.C. wines from its liquor stores – Albertans typically consume close to 1.5 million bottles every month. Ms. Notley’s government also passed, but did not enact, legislation that would give it the power to turn off the fuel taps. Mr. Kenney plans to enact that legislation as soon as he can. That will likely prompt a similarly swift response from British Columbia: Alberta supplies 65 per cent of the gasoline consumed in British Columbia. The B.C. government has argued the Alberta law is clearly unconstitutional, but it could not file a legal challenge while the trade measure was sitting on a shelf. Ian Lee, a public policy professor at Carleton University’s business school, said Mr. Kenney benefited from a deep resentment in Alberta toward the federal Liberal government’s approach to balancing resource development and the environment. But Prof. Lee said that anger is also directed toward opponents of the pipeline in B.C. The relationship between the two provinces is heading from bad to worse, he predicted. “He has the capacity and willingness to inflict pain on British Columbia. That’s not speculative. You just have to listen to Jason Kenney, there is no ambiguity,” he said. If Alberta does revive the trade war that Ms. Notley began, British Columbia could resort to trade retaliation. The two economies are deeply entwined, and both sides could get hurt. Trade between Alberta and B.C. is roughly balanced, according to the most recent data available from Statistics Canada. In 2014, Alberta’s exports to B.C. were worth about $16.75-billion; B.C. 's exports to Alberta rang in at $17.6-billion. If gas prices, already at record highs this spring in some parts of British Columbia, spike because of actions taken by Alberta, the B.C. government may have to respond. But for now, expect the B.C. government to be a reluctant player in this new war. Mr. Horgan didn’t lift a finger to help his fellow New Democrat, Ms. Notley, in the campaign. Instead, he told reporters that he will try to work with whoever is in power in Alberta. He is leaving Mr. Kenney to throw the first punch.